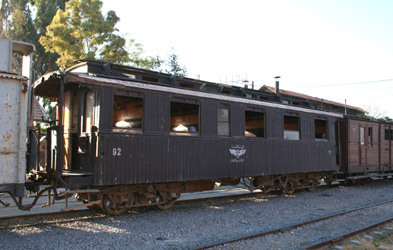 HJR (Hedjaz Jordan Railway) http://jhr.gov.jo. GMT+2 (GMT+3 last Sunday in March to last Saturday in October). Dial code +962. 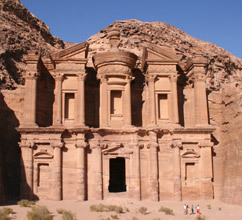 www.visitjordan.com. Things to see in Jordan. UK citizens need a Jordanian visa. You can get this in London from their embassy at 6 Upper Phillimore Gardens, Kensington, London W8 7HA, Tel. 020 7937 3685, www.jordanembassyuk.org. UK, US & most western European citizens can buy a visa on arrival at the border, cost around 20 dinars or £22. UK to Jordan by train? Before the war in Syria, it was perfectly possible to reach Jordan and Petra overland from London & Europe via Istanbul & Damascus, without flying. In the hope that it will one day be possible again, I've left this page pretty much as it was before the war. This page explained how to plan, book and make this wonderful overland trip both there and back. Jordan is an amazing place to visit. 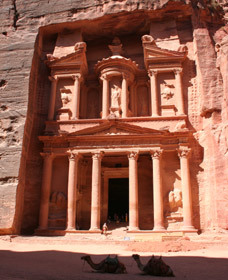 Amman is worth a day or two, but the prime attraction is of course the fantastic lost city of Petra (pictured, right). 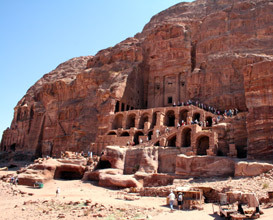 Things to see in Jordan: Amman, Azraq, Petra, Aqaba, Wadi Rum. 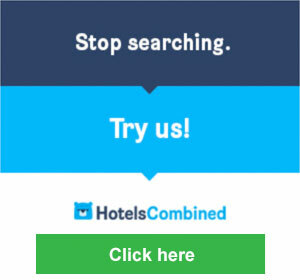 Hotels in Amman, Petra, Aqaba & Jordan Hotel search. This is how it used to be done. Of course, with the war making Syria a no-go zone, it's sadly now impossible. The train journey from London or Paris to Istanbul takes 3 nights with daily departures all year-round. See the London to Turkey page for train times, fares and how to book. Step 2: Istanbul to Damascus - check current travel advice for Syria! You can travel from Istanbul to Adana in southeastern Turkey largely by train, as shown here. Spend the night in Adana then take a bus onwards to Aleppo next day. Total journey time Istanbul to Aleppo 2 nights, 2 days. Several air-conditioned 100mph trains link Aleppo with Damascus every day, and there's a sleeper train too. See the London to Syria page for train times, fares, how to book and other information. There was (see the update below) a wonderful train service from Damascus to Amman twice a week over the historic Hedjaz Railway. This train ride should not be missed, although if time presses there are also daily buses which are faster. Both options are explained below. There are buses and taxis from Amman to Petra. If you are new to independent travel, planning a trip like this can seem daunting, but it's not that difficult. This may help you can plan a journey like this: How to plan an itinerary & budget. 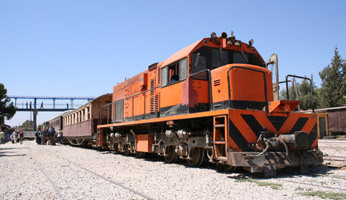 A narrow-gauge train used to link Damascus in Syria with Amman in Jordan, running over part of the famous Hedjaz Railway, although it hasn't run since 2006. 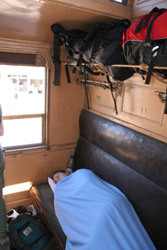 This historic train ride cost a mere $4, even though buses are faster and run daily. The Hedjaz line was originally built by the Turks to link Damascus with Medina in what is now Saudi Arabia, and it was the line attacked by T E Lawrence (Lawrence of Arabia) and the Arabs during the Arab Revolt in 1917. 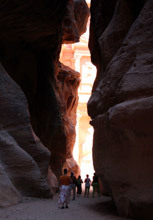 For more information about the history of the Hedjaz Railway, see http://nabataea.net/hejazad.html. My wife and I took the Damascus-Amman train in late 2005, when it ran twice-weekly. But by mid-2006 it was reported that it was no longer running because 'something is broken' - Syrian tank manoeuvres destroying the tracks, according to one source. The train has never run since. In May 2010 it was reported that a weekly Deraa-Amman passenger train had started running, making one round trip on Saturdays, though this went unconfirmed, and at present there is definitely no Damascus-Amman train at the running - or indeed any other trains in Syria, given the conflict. If you have any feedback about this train service, please e-mail me. Damascus to Amman is 223 km (139 miles). 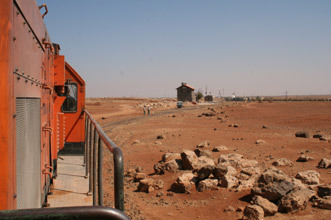 Trains are operated by Syrian Railways (CFS) and Hedjaz-Jordan Railway. The Damascus-Amman train was in fact two trains, and you had to switch from a Syrian train to a Jordanian train at Deraa while your passports were being checked. The Jordan Hedjaz Railway website is http://jhr.gov.jo. The Hedjaz station in Damascus was being rebuilt. The Amman train started from Damascus Kadem station 3-4km southwest of the city centre, reached by taxi for less than $2. 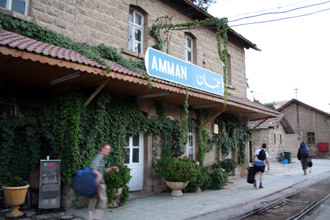 Amman railway station is 2.5km east of Amman city centre, taxis are available. There was no need to reserve in advance. In fact, it was not even possible to buy tickets in advance, as tickets were only sold on the day of travel an hour before departure at the station. They may not bother selling you a ticket even then, but tell you to board the train and pay later. So you just turned up half an hour before departure with $4 in Syrian pounds, asked about tickets and saw what they said. For the record, this section describes the (currently cancelled) Damascus-Amman train as it was in 2005. The Jordanian train from Deraa to Amman has two passenger coaches, with bench seats along the coach sides... You get great views (and covered in dust) from the open verandas at the end of the coach. Arriving by taxi at Damascus Kadem station, you walk over the footbridge to the narrow-gauge Hedjaz Railway platform on the far side of the station, behind all the mainline trains. At first, with the platform empty, you may think your train hasn't yet arrived from the sidings. Then it will slowly dawn on you that the ancient freight train standing one track over from the platform line actually IS the twice-weekly train to Amman. At the head of a long line of grey bogie boxcars is one solitary passenger coach, built in Nuremburg in 1905, with open verandas at each end and a 'clerestory' roof. It has a narrow side-corridor and a number of 6-seater compartments, the ancient seat springs trying to burst out of what's left of the upholstery. 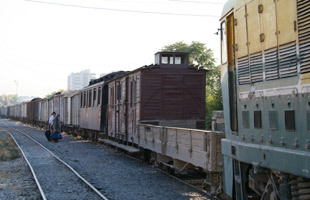 Ahead of the passenger coach is one 4-wheeler guard's van, a flat wagon and a Romanian-built diesel locomotive. This is the Syrian train that will take you as far as Deraa. The train leaves at 08:00 or maybe later, heading slowly out of the industrial suburbs of Damascus and then out into the arid countryside, descending a shallow valley. There are military outposts in this area, so the policeman travelling with the train may ask you not to take photos. The train twists and turns on its narrow-gauge tracks across the desert, at no more than 30-35 mph. Eventually, it arrives at Deraa. At Deraa, passports are collected and passengers told to transfer to the Jordanian train standing alongside. 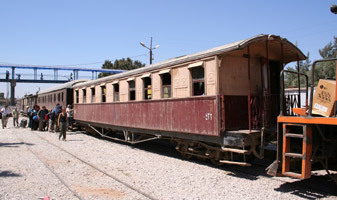 The Jordanian train has two wooden passenger coaches of similar vintage to the Syrian coach, also with open verandas at each end. 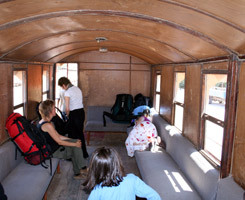 Inside, these cars are open-plan with bench seats along the coach sides. Two small guard's vans bring up the rear. The train is hauled by a beefy-looking General-Electric locomotive marked 'Hedjaz Jordan Railway'. After a long wait, passports are shown to their owners and handed straight over to the Jordanian policeman who has now joined the train. With a long low hoot the train leaves Deraa. You'll see the road frontier and all the wire fences that mark the actual Syrian/Jordanian border, which the train passes straight through. Some distance after the actual frontier the train reaches the little station at Mafraq, and here there is also a long stop while passports are processed by the Jordanians. South of Mafraq there is more desert, a river, bridges (including one rebuilt after being blown up by Lawrence in 1917) and a few hours later the train reaches the suburbs north of Amman. The train seems faster in Jordan, often travelling at 40-45mph. Now the train heads straight through the middle of a busy town market, past tenements and rubbish dumps. The policeman is riding on the leading coach veranda, shaking his finger at any kid by the tracks who looks as if they might throw a stone. Most Jordanian kids simply like waving at the train and love it when you wave back! The train follows a cultivated river valley between hills covered in houses, and finally rounds a curve into the pleasant little station in Amman. If you're interested in the history of the Hedjaz Railway, see http://nabataea.net/hejazad.html. In Jordan en route to Amman. Although nowhere near as interesting an experience as the train journey on the famous Hedjaz Railway, the Damascus-Amman buses are faster (4 hours) and run daily. It's possible to travel from Aleppo to Amman (or Amman to Aleppo) in one day, combining an Aleppo-Damascus train with a Damascus-Amman bus. JETT = Daily air-conditioned buses operated by Jordan Express Tourist Transportation, www.jett.com.jo, call +962 6 562 2430 fax +962 6 560 5005. 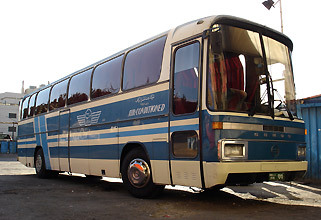 Karnak = Daily air-conditioned buses operated by Karnak bus company, Syria. Damascus to Amman by road is 180 km. The Hedjaz Railway no longer operates south of Amman, except for freight trains. But there are regular buses and minibuses from Amman to Petra (Wadi Musa is the name of the modern town next door). * = Departures from both Amman (Abdali bus station) southbound & from Aqaba northbound are at 07:00, 09:00, 11:00, 14:00, 16:00 & 18:00. Journey time 4 hours. Additional departures run several times daily from Amman's Wehdat, Tabarbour & 7th Circle bus stations. JETT = Jordan Express Tourist Transportation, www.jett.com.jo, +962 6 562 2430 fax +962 6 560 5005. Air-conditioned buses. The fare is 8 JD Amman-Petra, 7.50 JD Amman-Aqaba. Taxi = service taxis, usually 25-seater minibuses. The taxis leave when full and usually operate throughout the day. The fare from Amman to Petra is 3 JD or less, journey time about 2 hours 40 minutes. These minibus taxis leave from Amman's Wahedat bus station. Hiring a private taxi to take you to Petra will cost about 40-50 JD (£36-£46) after negotiation. For ferries from Aqaba to Nuweiba in Egypt, see below. 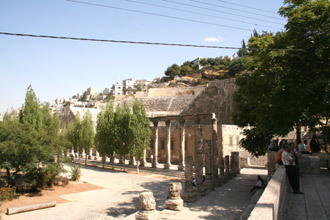 Amman is a sprawling modern city which has grown very rapidly from what was once a small village. Built on a number of hills and valleys, it does have a centre with a citadel and Roman amphitheatre, but isn't worth more than a day if you're passing through. The Al Saraya Hotel, near the centre, is a good choice for budget travellers. 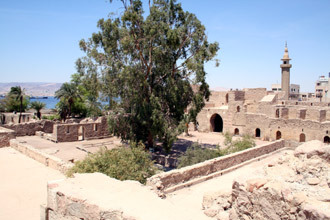 T E Lawrence fans will want to visit the castle at Azraq, an hour's drive east of Amman. The castle was used as the headquarters of the Arab Revolt for a while in 1917, and Lawrence slept in the room immediately above the gatehouse. 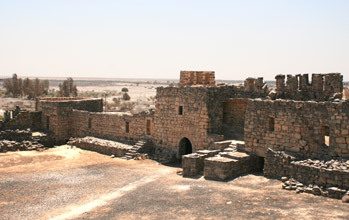 Azraq castle. Lawrence of Arabia slept in the room above the gatehouse in 1917. Jordan's premier attraction, and deservedly so. The famous ruined city of Petra nestles in a valley surrounded by mountains and approached through over a mile of narrow defile. A ruined Roman city in northern Jordan, well worth a visit. Now Aqaba is a modern town and holiday resort, but when Lawrence and the Arabs attacked it was little more than a fishing village. The fort they captured from the Turks is still there and can be visited. A beautiful area of desert and rocky outcrops, it enthralled Lawrence, and much of the film 'Lawrence of Arabia' was filmed here. You can visit on a jeep safari as a day trip from Petra or Aqaba. Brewing up in Wadi Rumm. It used to be possible to go to Israel by sea from Greece, then travel overland from Jerusalem to Amman. However, all ferries from Piraeus via Cyprus to Haifa in Israel were suspended in 2001 and show no signs of restarting. An air-conditioned bus leaves Amman (JETT terminal) on Tuesdays, Thursdays, Saturdays & Sundays at 14:00, taking some 20 hours to reach Cairo. Fare 75.5 JD (about £69 or $102). It is run by Jordan Express Tourist Transportation (JETT), www.jett.com.jo, telephone Amman 662722, fax 601507. This bus crosses Israel - remember that you won't be able to re-enter Syria with any sign of a visit to Israel in your passport. It's also possible to travel from Jordan to Egypt avoiding Israel, using a ferry. Here are details for the southbound journey - details for the northbound journey are shown on the Egypt page. Travel from Amman or Petra to Aqaba by bus or service taxi as shown above. AB Maritime (www.abmaritime.com.jo) operate ferries from Aqaba in Jordan to Nuweiba in Sinai, Egypt. A daily fast catamaran leaves Aqaba at 13:00, crossing 1 hour, and a daily conventional ferry sails at 15:00, crossing 3-4 hours. The fare by regular ferry is US$65 economy class, $70 first class. By fast ferry it's $75 economy class, $95 1st class. You must check in at least 2 hours before the ferry sails. It's reported that you need to buy the ferry ticket in Aqaba town, not at the ferry terminal, which is a little way out of town. There may also be an Jordanian exit tax to pay, about 10JD. There are buses from Nuweiba to both Cairo and Sharm el Sheik, taking several hours, although it's reported tourists may no longer be allowed on the direct coast road but may have to detour around Sinai with a change of buses Dahab, please check locally. For trains within Egypt, see the Egypt page. I recommend planning a trip with the relevant Lonely Planet guidebook - I've found that the L-P guides are the best out there for the independent traveller. Or buy direct from the Lonely Planet website, with shipping worldwide. The Middle East guidebook covers Turkey, Syria, Jordan, Egypt, Iran, Israel and several other countries.